New Year Card from Korea | Daily Life in Japan, Muravej Co.
A letter arrived from Korea. 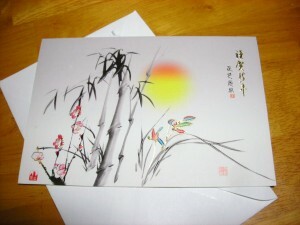 It was a new year card from my ex-colleague who went back to Korea and is working for a Korean company. It is good to have friends all over the world. It is a privilege of scientists. This entry was posted in Daily life, Science and Technology, teaching and tagged colleague, Korea. Bookmark the permalink. That was one of the great things for me about living in Japan, meeting fantastic people from all around the world and making long lasting friendships. Thanks, Japan-Australia, for coming to my blog. Good to know that you make friends here. It might not have been easy for my wife, Katya, to find friends, partly because we do not live in a big city. Inviting Maya-san the dog from Katya’s home was a good idea. Anyway, we are now having fun together.